Monica, an accountant, and Ronald, a warehouse supervisor, welcome daughter Robyn Rihanna Fenton. Her childhood on the Caribbean island of Barbados is deeply affected by her father's addiction to crack cocaine and parent's rocky marriage, which ends when she's 14. The shy kid finds an outlet through singing. After forming a girl group with two classmates, Rihanna, 15, auditions for veteran producer Evan Rogers, who tells Entertainment Weekly, "The minute Rihanna walked into the room, it was like the other two girls didn't exist." She eventually moves to Connecticut to live with Rogers and his wife, while cutting a four-song demo. "When I left Barbados, I didn't look back," Rihanna adds. "I wanted to do what I had to do, even it meant moving to America." Rihanna's demo makes its way to Def Jam and the budding star is invited to audition for rapper turned Def Jam president Shawn "Jay-Z" Carter. "I was in the lobby just shaking," Rihanna, who sings Whitney Houston's "For the Love of You," tells Rolling Stone. "I signed her in one day," Jay-Z adds. "It took me two minutes to see she was a star." 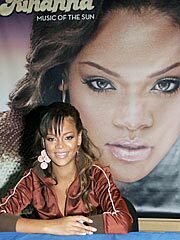 Rihanna releases her first single, "Pon de Replay," kicking off her debut album, Music of the Sun, and it peaks at No. 2 on Billboard's Hot 100. The Barbados beauty tours with Gwen Stefani to promote her album, which sells more than 2 million copies worldwide. Rolling Stone calls the album "a seductive mix of big-voiced R&B and souped-up island riddims – what Beyoncé might have sounded like if she had grown up in the West Indies and skipped the whole Destiny's Child thing." Eight months after the release of her debut album, Rihanna releases her sophomore album, A Girl Like Me. The album boasts Billboard Hot 100 chart-toppers "S.O.S." and "Unfaithful," and earns her four Billboard Music Awards, including Female Artist of the Year. But the success is paired with gossip that Rihanna is romantically involved with her mentor Jay-Z, who is dating pop star Beyoncé. "At first I was like, 'Ha ha, it's funny,'" Rihanna tells the AP. "Now I just ignore it and I'm numb to it...You cannot stop people from saying what they want to say." Rihanna follows the likes of Janet Jackson and Christina Aguilera when she sheds her innocent image for an edgier look and sound. She releases the single, "Umbrella," which reaches the top spot on Billboard's Hot 100 in June and kicks off her upcoming third album, Good Girl Gone Bad. "It shows such growth for her as an artist," Jay-Z tells the AP." "If you listen to the lyrics to that song, you know the depth and how far she's come." After becoming the face of Cover Girl cosmetics, Rihanna appears in PEOPLE's Most Beautiful issue sans makeup. "The best thing about going without makeup is that it takes a lot less time to get ready," Rihanna tells PEOPLE. "You feel comfortable and free." The glowing singer is also listed at No. 8 on Maxim's Hot 100 and No. 59 on EW's 100 Stars We Love, among such up-and-comers as Hayden Panettiere and Shia LaBeouf. Rihanna's latest disc, Good Girl Gone Bad, debuts at No. 2 on Billboard's Top 200 album chart. It features songs produced by Timbaland, cameos by Jay-Z and has a track, "Rehab," written for her by Justin Timberlake. "'Good Girl Gone Bad' was an expression of where I am at this point in my life, where I am in my career. It just represents my rebelliousness," she tells EW. Rihanna cleans up at the 2007 MTV Video Music Awards, taking home two of the evening's most prestigious trophies for her smash hit "Umbrella": Video of the Year and Monster Single of the Year. The singer was nominated for five awards, including Female Artist of the Year. After making a splash with an even shorter do, Rihanna performs "Umbrella" and "Don’t Stop the Music" at the 2008 Grammy Awards. The 19-year-old singer also goes home with her first Grammy for Best Rap/Sung Collaboration with Jay-Z for her hit "Umbrella." During her acceptance speech, Rihanna says, "Dad, I know I promised you I'd give you my first Grammy, but we're going to have to fight for this one!" Who's the Most Talked-About Star of the Year? Britney ... Angelina ... Jen? Tell us – it's your last chance to vote! TuesdayKatherine Heigl & T.R. Knight Do Dinner in L.A.